EASTERDAY, DANIEL D.	PLAINTIFF	SIGALE, DAVID G.
ILLINOIS STATE RIFLE ASSOCIATION	PLAINTIFF	SIGALE, DAVID G.
SECOND AMENDMENT FOUNDATION INC	PLAINTIFF	SIGALE, DAVID G.
Edited by InterestedBystander, 05 April 2018 - 03:39 PM. Just joined SAF and GOA and renewed my ISRA membership. What about GSL, since they brought the suit in the first place. I just joined to give them a few bucks. Who has a link to the NRA's lawsuit? Do we know where they filed? I searched 19th Judicial Circuit Court of Lake County, Illinois where I found the other one. Maybe not filed yet or not in system. Edited by InterestedBystander, 05 April 2018 - 07:10 PM. They're next on the list! HERE is why I'm an NRA life member. Me as well. I've been frustrated with them lately, but we're far better off with them vs without them. I see announcements about two different lawsuits, I think. I see one lawsuit filed, does anyone have a link to the other one? When did they lose the appeal? Oops, no, no loss on appeal but I fully expect that to happen. What I was thinking was an identical suit filed in the Eastern District of California, Judge Shubb found that the mag doesn't infringe on the Second Amendment right and doesn't violate the Takings Clause. Wiese v. Becerra. Is the ISRA lawsuit filed today a separate suit? The Illinois State Rifle Association (ISRA) and Second Amendment Foundation (SAF) have filed a lawsuit against the Village of Deerfield this morning, April 5, 2018. This legal action is a challenge to the Defendants Ordinance O-18-06, passed on April 2, 2018, which bans assault weapons (used specifically as that term is defined in O-18-06) within the Defendants municipal limits. The suit was filed In the Circuit Court of the Nineteenth Judicial Circuit Lake County, Illinois, Chancery Division. To make a contribution to the Illinois State Rifle Association Legal Assistance Committee, please donate here. Please join the ISRA NOW! The link to donate to the ISRA's Legal Assistance Committee didn't get transferred to you post and there was a bad URL in some of their recent alerts, so here is the link to donate. I just donated $25 and will probably end up donating more. Check this out on when they passed the first ordinance. Some interesting quotes from the Mayor ""We are not saying we are discussing this tonight and next week we're going to ban firearms. We have no intention of doing that." So wait, if your intent was not to ban firearms then, then how is this new ordinance an amendment. Its obviously a new law. It would be like amending the ordinance around overnight parking to include banning firearms. They are that much alike. Oh another quote, "We're not interested in getting involved in lawsuits," Rosenthal said in an interview." This was in 2013. Obviously she is now. Donate link is bad. Also bad from ISRA alert but good at site...would be a good time for it to be active! We appreciate everyone who has taken time to generously donate today in response to our alerts. Thank you to all of those who successfully donated. While some were able to donate and join the ISRA, many of you reported that you received an error when attempting to donate. We know that was frustrating and we have been working on resolving this issue for those that had difficulty. We endeavor to test every email that leaves our desks for accuracy and that the links we insert will work for every user on every browser at all times. Sometimes, even with the best effort, something goes wrong. We appreciate your patience and understanding and want to send another link to make sure you can help us in this very important effort to preserve our liberties here in Illinois. Please click on the DONATE HERE text to be taken to the donate page of our Legal Assistance Committee. You will need to sign in with your email address you used to create your ISRA account and your password. If you have not previously registered please click Register to create your account. If you have forgotten your password please click on the Forgot Password? link on the donation form. Alternatively, you can go to directly to the website www.isra.org to join, donate or review all of the ways the ISRA serves you. We are at the office to assist you at 815-635-3198 from 8:00 am to 4:30 pm Monday through Friday. Edited by InterestedBystander, 06 April 2018 - 02:10 PM. Honored to have you as a member, sir. At the Village Board meeting on February 20, 2018, Mayor Rosenthal directed that Staff and the Village Attorney present a report concerning the implementation of a ban on assault weapons. The proposed ordinance would ban the possession, sale and manufacture of assault weapons and large capacity magazines in the Village and is based on the City of Highland Park ordinance that withstood a legal challenge. The ordinance passed at the Village Board meeting on April 2 and will take effect June 13. The ordinance provides for an effective date 60 days after the ordinance goes into effect and does not otherwise regulate or prohibit rifles, shot guns, pistols or ammunition. View the ordinance here. The Village of Deerfield has received the suit filed April 5 concerning the Ordinance adopted April 2 banning assault weapons and large capacity magazines. The Village believes it has acted within its statutory authority and will be evaluating the suit in order to respond appropriately. No additional statements will be made on this pending litigation at this time. View the Village's statement on the Easterday Assault Weapons Ban Lawsuit here. 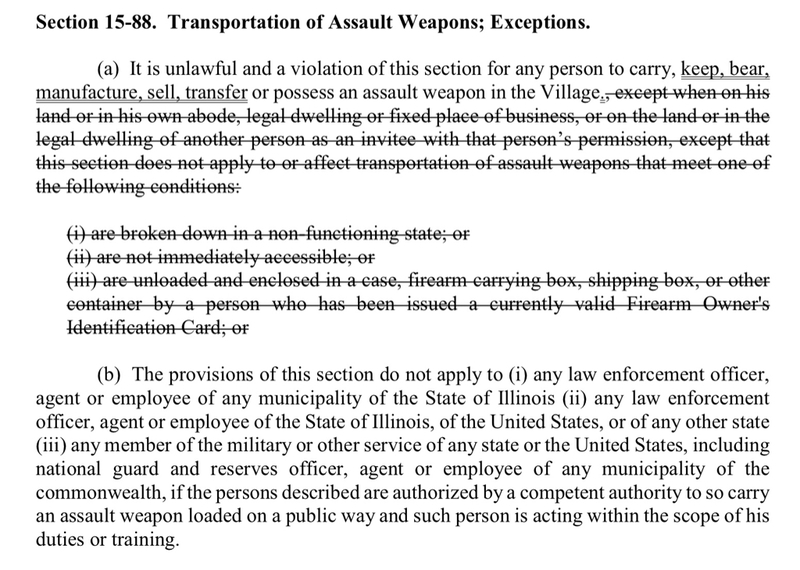 The sole legal issue in the Easterday lawsuit filed by the Illinois State Rifle Association and Second Amendment Foundation is whether the Village lawfully amended its prior assault weapons ordinance under Illinois law. The lawsuit admits that the Village lawfully enacted its prior assault weapons ordinance during the limited period of time which the State Legislature allowed local governments, like the Village, to regulate the possession or ownership of assault weapons. The lawsuit admits that the State Legislature expressly grants the power to amend such an assault weapons ordinance in the future. The lawsuit admits the lawfulness of the Villages ban on the sale of assault weapons. And the lawsuit effectively concedes the lawfulness of the Villages assault weapons ban under the Second Amendment to the U.S. Constitution. When the State Legislature allowed home rule units, like the Village, the opportunity to enact an assault weapons ordinance and amend such an ordinance in the future, the State Legislature recognized that different communities should be allowed to democratically address the possession or ownership of assault weapons in accordance with the different needs and interests of each community. In allowing for amendments to assault weapons ordinance, the State Legislature recognized that communities should be allowed to amend their assault weapons ordinances to address their changing needs and interests. Accordingly, the Village amended its prior assault weapons ordinance to address the Villages best interests for the protection of the Village. Edited by InterestedBystander, 08 April 2018 - 09:49 AM. Does anyone have a copy of the original ordinance they amended. I would like to read it. Heres a screen cap that shows some (all?) of the text being replaced via the strikethru and new wording as originally proposed. Older links posted seem to be gone or updated. Edited by InterestedBystander, 06 April 2018 - 06:32 PM. So in Deerfield only the government or agents of the government are allowed to possess their definition of assault weapons? That in itself is EXACTLY the reason for the second amendment, To combat a tyrannical government. I’m not implying revolution but what to do? Read what I posted about Mass above. How long before that ship docks in Springfield? Edited by WitchDoctor, 06 April 2018 - 07:30 PM. Thank you for standing up for us all. And with Mr. Sigale as counsel, you’re in good hands. Wow, I just looked up Mr. Sigale's practice and record. Looks like they got the right guy! A woman's "Right to Choose" the abortion issue starts with the words "No! ", "Stop! ", and "I am armed! ".